We offer a broad-based MMus programme with three pathways: musicology, performance and composition. All three pathways can be used as professional training for themselves, or as preparation for PhD study. Students in our MMus programme benefit from intensive one-to-one instruction with world-leading experts in music history, cultural studies of music, performance studies and analysis; internationally noted performers with active solo and ensemble careers; and prominent composers of contemporary art music, electronic music, media music (including film, television and video game music) and jazz. Do you want to know how great film scores were composed? Are you interested in the ideas behind musical performances? Expand your knowledge of the components and aspects of music with the MMus Music (Performance, Composition and Musicology) at the University of Southampton and enhance your musical talents. This broad MMus programme will teach you the elements of musical performance, as well as the different genres of music. Gaining this experience across a variety of categories will prepare you for a successful career in the music industry. MMus (Musicology Pathway) – Two samples of written work, between 1500 and 2500 words each, on musicological questions of your choosing. MMus (Composition Pathway) - A portfolio of 2-4 compositions, totalling 15-20 minutes of music, demonstrating your range and compositional techniques. Regardless of genre or style, and where appropriate, please provide scores as PDF files, and performance documentation/realisations/recordings/multimedia examples as unrestricted links to files uploaded to a hosting site such as Soundcloud/YouTube/Vimeo/Youku, etc. MMus (Performance Pathway) - Samples of recorded performance, this should be 2/3 contrasting pieces for a total of 20-30 minutes that demonstrate your technical proficiency, interpretative capacity. 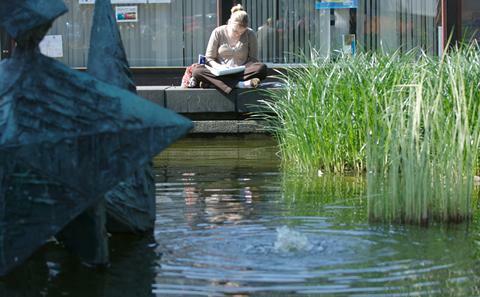 Candidates should note that studying at Southampton requires the ability to read at sight and to learn pieces quickly. Please provide these links to performance videos posted via YouTube. These should be uploaded with your application form and submitted or alternatively sent using the Dropoff service as detailed below. You have a 30 day period once your application is submitted to complete this and you will receive reminder emails of the process. After this your application will automatically be withdrawn from the decision making process. The Southampton pre-Masters can be taken if you have qualifications or grades that do not meet University of Southampton direct entry criteria. You will be guaranteed a place on this course subject to successfully completing the pre-Masters. Visit our pre-Masters Programe to find out more about these degree programmes. Academic entry requirements: First or upper second class honours degree, or an equivalent standard in other qualifications approved by the University in Music or a cognate discipline. - IELTS 7.0 overall, with minimum of 7.0 in writing, 6.5 in reading, listening and speaking, or an equivalent standard in other qualifications approved by the University. - IELTS 6.5 overall, with minimum of 6.5 in reading and writing, 6.0 in listening and speaking, or an equivalent standard in other qualifications approved by the University. Optional module: Analytical Techniques and Performance teaching seminar can be replaced by Individually Negotiated Topic, or another Humanities MA module. MUSI6035 Individual Research Project is Compulsory for all MMUs pathways, but students can choose whether to take the module in Semester 1 or Semester 2 (Therefore it is listed below in both semesters, but this does not mean it is started in Semester 1 and contuined into Semester 2). Books Where a module specifies core texts these should generally be available on the reserve list in the library. However due to demand, students may prefer to buy their own copies. These can be purchased from any source. Very few Music lecturers insist that students purchase specific set texts. Copies of set texts are made available in Hartley Library, if necessary in the reference-only "course collection" or on short-term loan. Students may wish to own copies of recommended books but are free to choose which to buy and which to borrow. Some lecturers prepare course handbooks for the modules they are teaching. These are generally made available free of charge to students taking the modules. For unusually bulky handbooks there may be a charge to pay -- never more than £10.00 per copy. Music software packages are available for licensed use at designated university computer workstations free of charge to Music students. Students who wish to install compatible software on their own computers will have to cover the cost themselves. Some modules suggest reading texts as optional background reading. The library may hold copies of such texts, or alternatively you may wish to purchase your own copies. Although not essential reading, you may benefit from the additional reading materials for the module. Equipment Instruments and equipment: Hartley Library holds a very large collection of sheet music which students can borrow free of charge. Students who want or are advised by teachers to buy their own music, perhaps in order to mark it up, will be expected to cover the cost themselves. The Music Department has a large collection of keyboard instruments to which keyboard students are allowed free access. It owns a number of other instruments (piccolo trumpet, bass sax, basset horn etc.) which students can borrow on their teacher's recommendation. We do not charge for the use of them but do recommend that students make private insurance arrangements when taking them off campus, especially on tour. If not returned intact they must be replaced like for like at the student's expense or at their insurer's. Students may wish to hire professional accompanists to play with them in performance exams. Accompanists charge varying levels of fee (rarely more than £60.00 per exam accompaniment, including prior rehearsal) and students are expected to pay the fees themselves. Travel Field trips are infrequent and almost always optional. When occasionally they do happen students involved may be expected to cover travel costs and to pay for admission to the venue(s) visited. Staff organizing trips make every effort to keep costs to a minimum, negotiating group and student discounts whenever possible. No one trip is likely to cost more than £20 total. Other Vocal and Instrumental Lessons. Specialist vocal and instrumental tuition for single and joint honors Music students taking performance modules is generally provided free at the point of delivery. When lessons happen away from Highfield Campus students are expected to cover the cost of travel to and from their lessons. Students are expected to cover the cost of travel to and from off-campus rehearsal, performance and music examination venues. Most of those we use are within walking distance of Highfield Campus. Students taking instrumental lessons are expected to own and maintain their own instruments, maintenance including the cost of repairs and of replacement parts (new strings, drumheads etc.). Students are strongly advised to arrange insurance for their instruments, covering all the usual risks including theft from places of residence and from university storerooms. Storage space for instruments is available in Music Department storerooms. Dozens of students have access to them: it is not possible to guarantee security. The university will accept no responsibility for loss or damage to instruments left in storerooms. Students taking performance modules will be given keys to practice rooms and storerooms. Keys must be returned on or before graduation day. Students will be charged £10.00 per replacement key in the event of loss. Jazz and pop students must buy and use their own ear protectors if asked to do so by a teacher. Hartley Library holds a very large collection of sheet music which students can borrow free of charge. Students who want or are advised by teachers to buy their own music, perhaps in order to mark it up, will be expected to cover the cost themselves. The Music Department has a large collection of keyboard instruments to which keyboard students are allowed free access. It owns a number of other instruments (piccolo trumpet, bass sax, basset horn etc.) which students can borrow on their teacher's recommendation. We do not charge for the use of them but do recommend that students make private insurance arrangements when taking them off campus, especially on tour. If not returned intact they must be replaced like for like at the student's expense or at their insurer's. Students may wish to hire professional accompanists to play with them in performance exams. Accompanists charge varying levels of fee (rarely more than £60.00 per exam accompaniment, including prior rehearsal) and students are expected to pay the fees themselves. Turner Sims -- the university concert hall -- makes 10 tickets for each of its own-promoted concerts available free of charge to Music on a first come, first served basis. (There are very rare exceptions: gala concerts intended to raise funds for Turner Sims for instance.) Monday and Friday lunchtime concerts in Turner Sims organised by the Music Department are free of charge both to Music students and to the wider public. External promoters hiring Turner Sims can charge what they like for admission to concerts. Student-run performing arts societies such as the University of Southampton Symphony Orchestra, JazzManix and Showstoppers (there are many others which Music students might like to join) are free to set their own membership subscriptions. The Music Department does not contribute directly towards the cost of running these societies. The three different pathways that are available to MMus students have different methods for their students to learn and different ways to teach, depending on the module and pathway they are taking. You will develop your knowledge and understanding through tutor-led seminars, the preparation of presentations and student-led seminars, one-to-one tutorials with your supervisor for the dissertation, study visits, independent research and group projects. The different modules making up the MMus will assess your thinking skills in different ways, including the submission of portfolios of work, group and individual presentations, coursework essays and analyses, and the 20,000 word dissertation. The dissertation is a core element in establishing the acquisition of appropriate skills and the application of research techniques. Your supervisor will be available to provide regular and supportive advice, guidance and feedback on your progress. Activities particularly designed to enhance your thinking skills include tutor-led and student-led seminars, independent research and practice, individual tutorials and the preparation of assessed coursework and the portfolio. The different modules making up the MMus will assess your knowledge and understanding in different ways, including group and individual presentations, coursework essays and analyses, and the composition portfolio. You will develop your knowledge and understanding through tutor-led seminars, the preparation of presentations and student-led seminars, individual instrumental or vocal lessons, study visits, independent study and practice. The different modules making up the MMus will assess your practical skills in different ways, including group and individual presentations, coursework essays and analyses, and the recitals.